Please try entering https://graph.facebook.com/488790224570746/photos?fields=source,link,name,images,album&limit=1000 into your URL bar and seeing if the page loads. 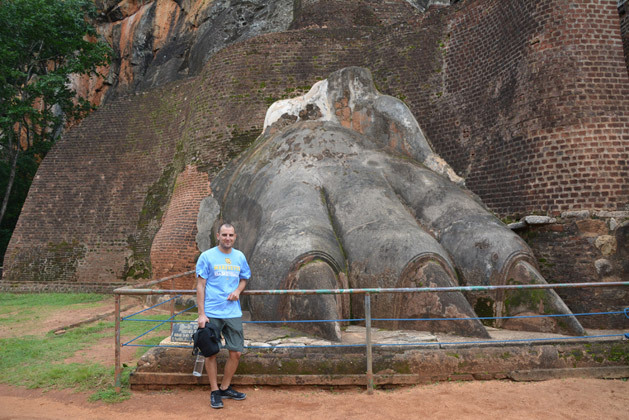 Today, our tour of Sri Lanka’s Cultural Triangle brings us to the ancient and sacred city of Sigiriya, more specifically, Sigiriya Rock. 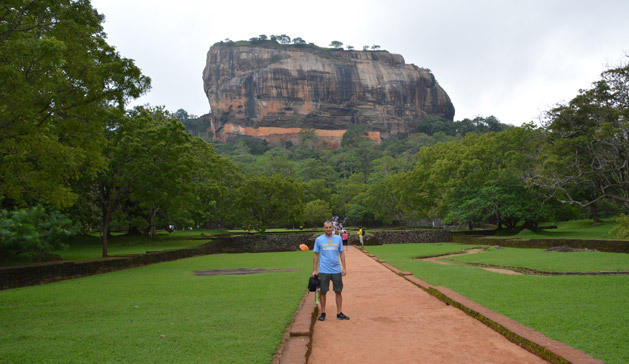 Sigiriya Rock, also known as Lion Rock and Rock Fortress, is another UNESCO world heritage site, and is a fortress on top of a 200m high rock. We will be attempting to climb the rock this morning, hopefully before it rains. 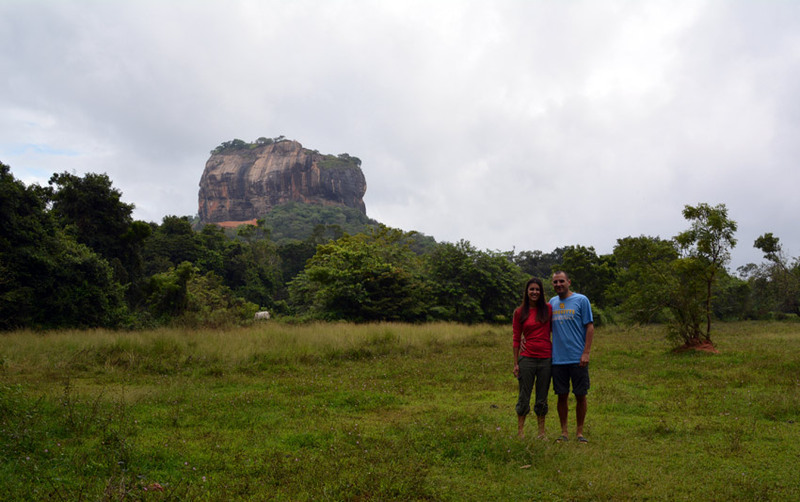 Us before the climb with the Sigiriya Rock looming in the background. Like any attraction in Sri Lanka, we have to buy a ticket to get in, $30 USD each. It’s just like running a 10k. We pay someone else to exercise for a couple of hours. The crowds here are also much bigger than we saw yesterday in Polonnaruwa, but the walls and paths as we approach the walk are equally awe-inspiring. The hike includes a mix of ancient and restored stone steps as well as modern metal stairs with railings. 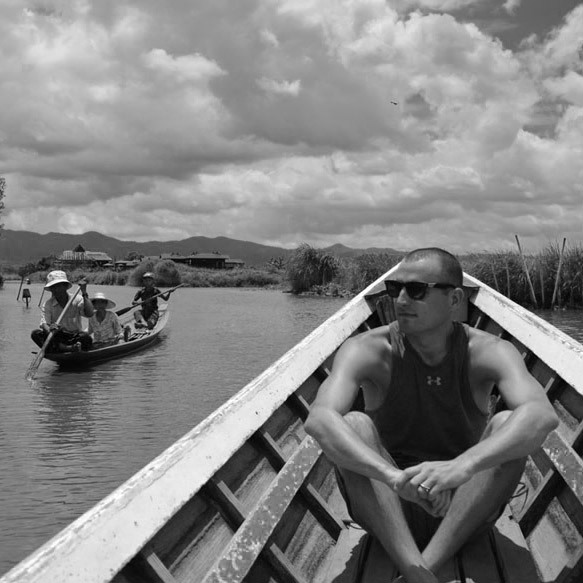 The narrow parts involve some waiting in line as tourists huff and puff ahead of us, but the views are worth it. 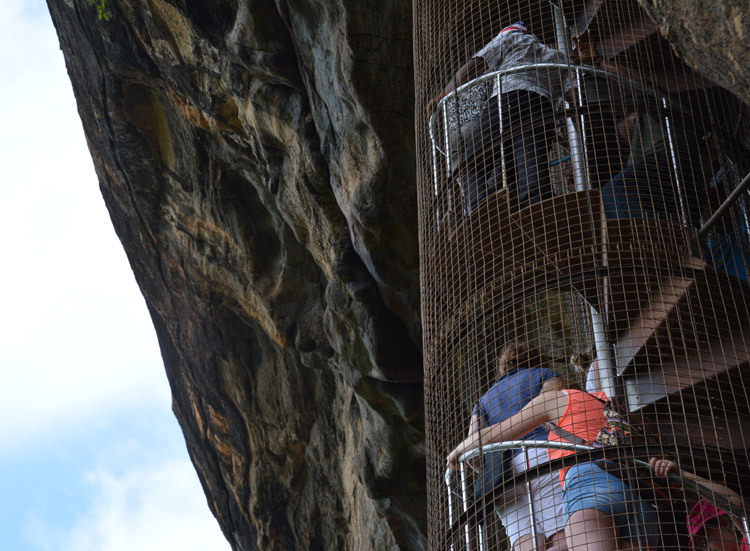 The most interesting climb is a spiral staircase that has been drilled into the side of the rock. I try to avoid looking at the creeky supports as we slowly twist our way up the stairs. As unsafe as it appears, it is still much better than what it must have been like back in 477 AD. 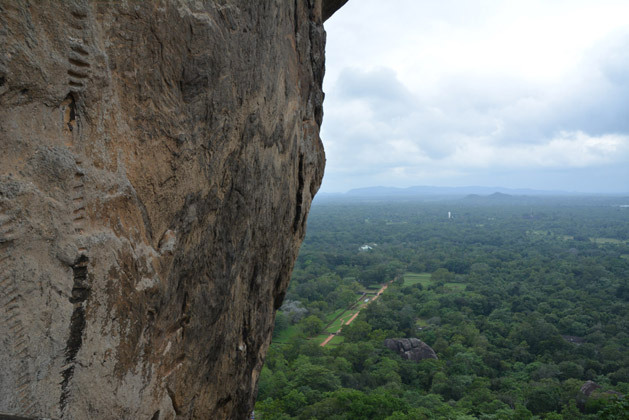 We can still see the ‘steps’ that are carved into the sides of the rock that the ancient citizens used to climb up. 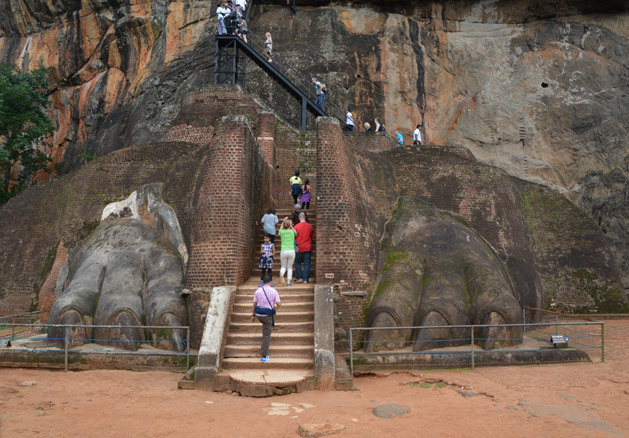 The old “stairs” of Sigiriya Rock. 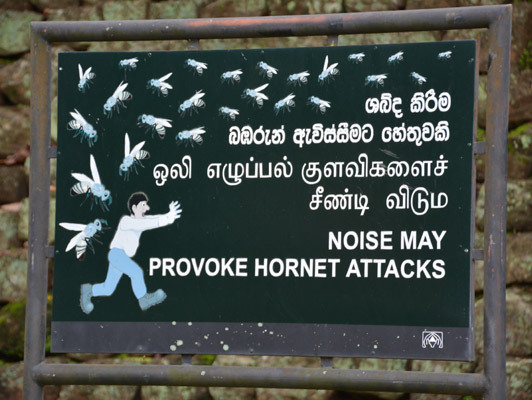 Something to add a little to our nerves on the climb is the looming possibility of being attacked by hornets. In the ancient days, the fortress was protected by throwing hornet nests off the top onto enemy armies below. 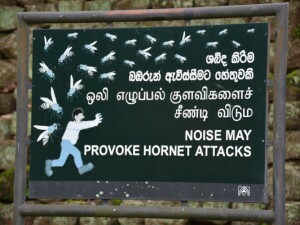 Apparently there are still a lot of hornet nests in the area, and signs like these remind us to be quiet in order to not provoke them. Now even the signs are part of the ruins. The first naked woman picture on This World Rocks! We come across some really great ruins. An audience chamber with old bleachers of sorts carved into the rock, a graffiti wall with ancient carvings complete with colors of voluptuous women, old archways that have since fallen down, and many others. The best part comes when we reach the entrance to the fortress itself. The Rock Fortress, or Lion Fortress, is the final part of the climb. 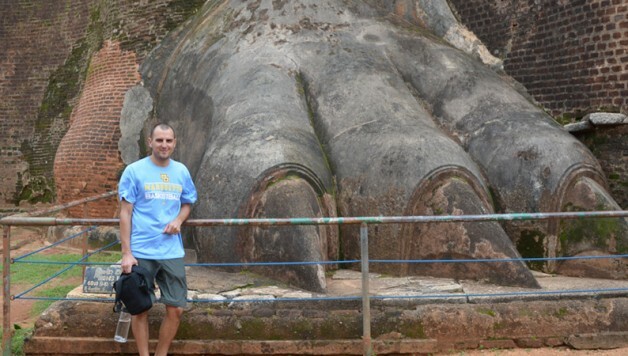 It is an amazing site to see the former paws of the ancient lion statue that guarded this entrance. I can only imagine what this statue looked like before it crumbled, but if there had to be a piece of it to stand the test of time, I’m glad it was the paws. 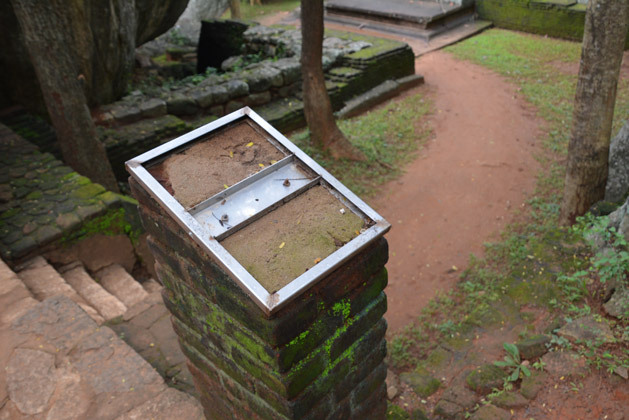 At the top of the fortress, much of the ancient ruins are still intact. 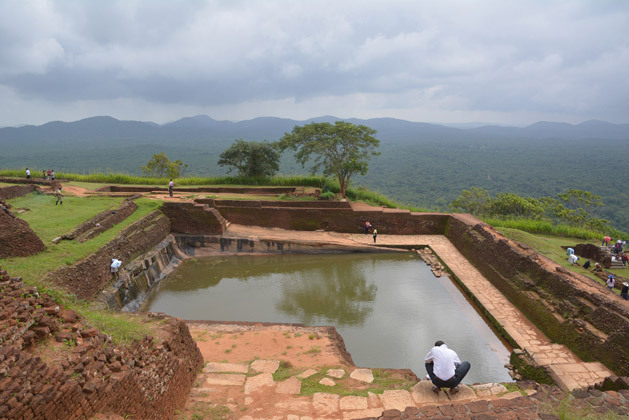 The foundation, walls, throne, gardens, and even a pool are incredible; we can almost picture the royal families ruling from their perch with a 360 degree view for miles. 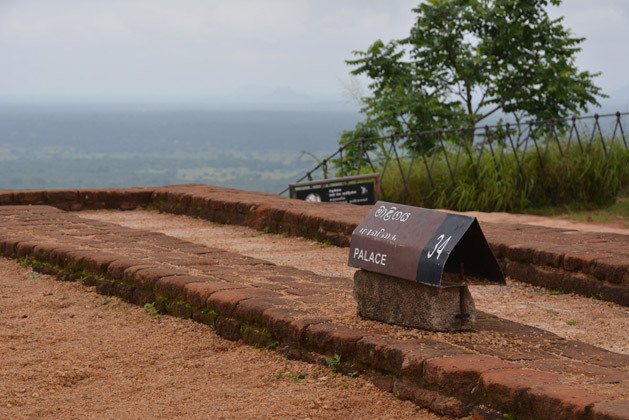 The palace itself is at the highest possible point, but is now just a gravel space. It is fun to try and imagine what this palace must have looked like back then, ruling and overlooking the entire country from right here. loved your post. i recently climbed this as well.